are used in is included below the photos. 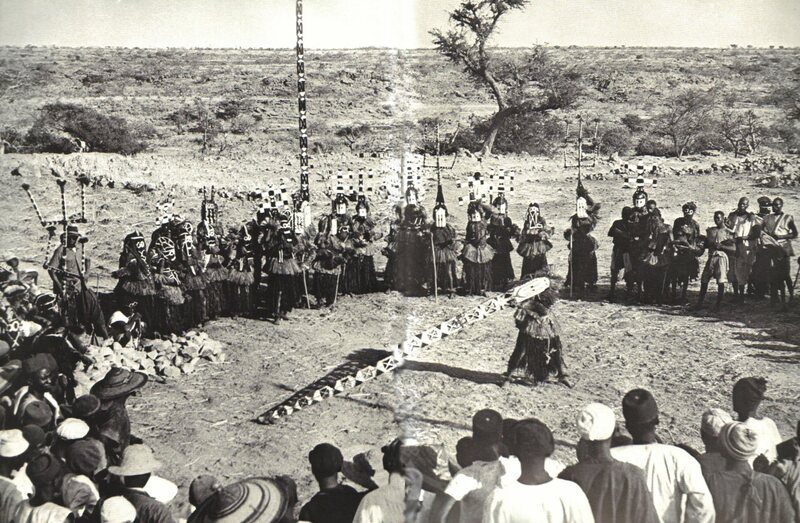 during baga-bundo rites performed by small numbers of masqueraders before the burial of a male Dogon. 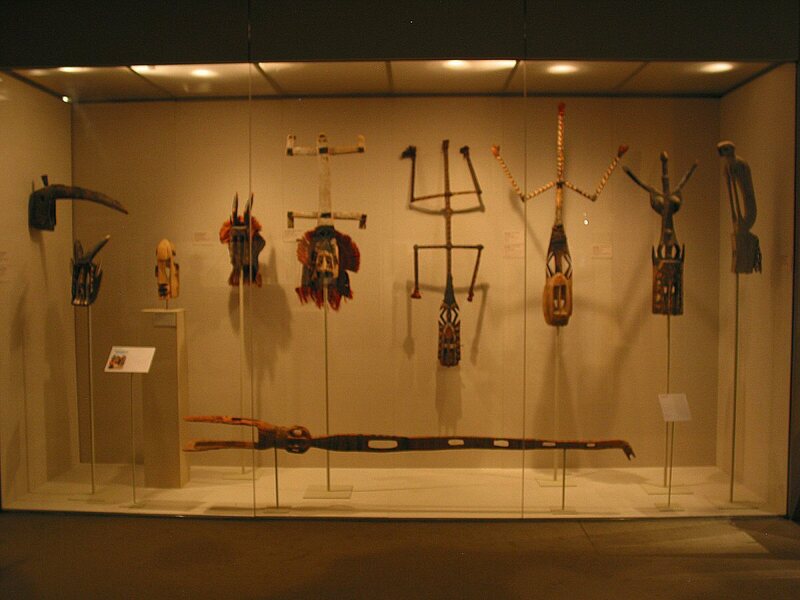 regions where the Dogon live and hunt. They include among others - antelopes, hares, lions, hyenas, cows, birds and monkeys. color rather than their shape. For the Dogon, Dege is the black monkey, while the white monkey is known as Omono, and the red monkey is called Ko. for wickedness, gluttony and must not be emulated because it is the antithesis of the Dogon order (Sieber & Walker 1987, p. 134). 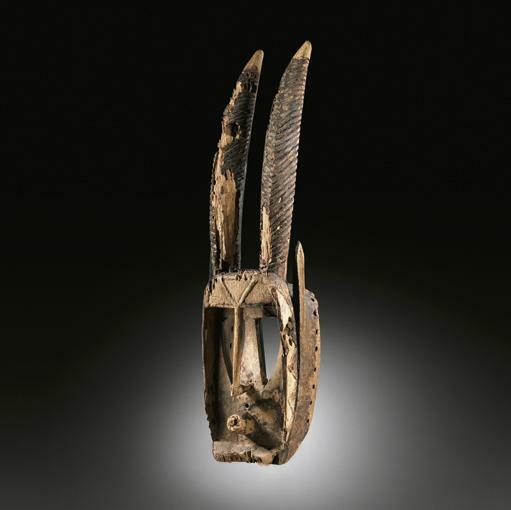 I have always liked the Dogon animal masks, and the monkey and rabbit masks have always been my favorite. as exactly how old it is I am not sure. 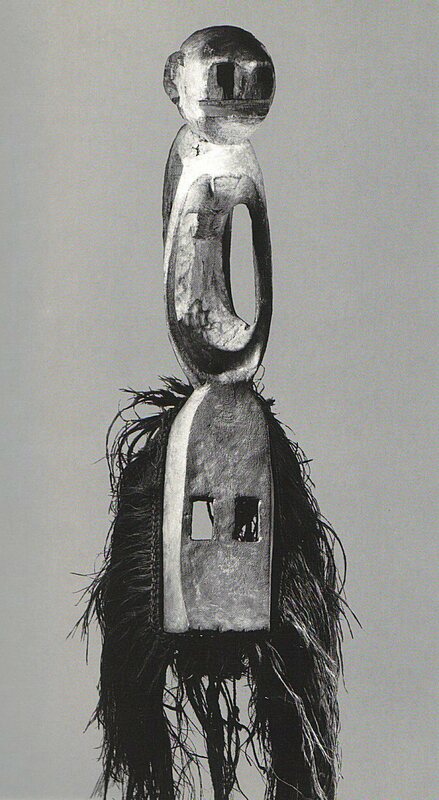 I especially love the small ears that are represented on this mask and they are initially what drew me to it. Other examples of Dogon monkey masks for reference purposes. There are examples of other types of Dogon animal masks under the monkey masks. 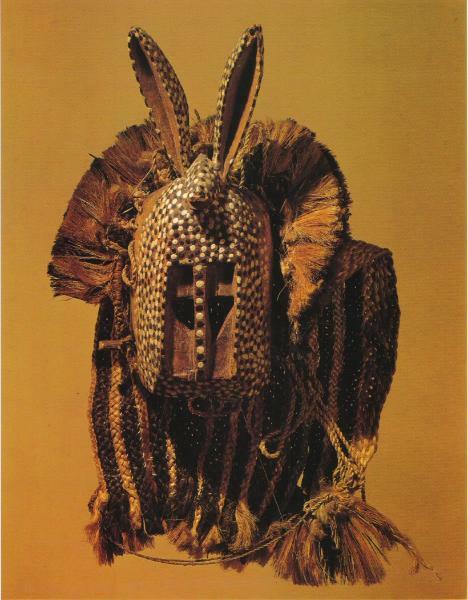 costume includes, besides the black raffia neck covering attached to the mask, trousers, bracelets, and ankle ornaments of braided fibers. Ugly male of the bush sitting at the top of a tall tree Your stomach full of fruit all eyes are on you . . . the drum plays for you . . .
which it is saturated, have given it a crusty patina similar to that of certain figures. F.N. gives us a sense of how it was meant to look (Griaule 1938, p. 46). 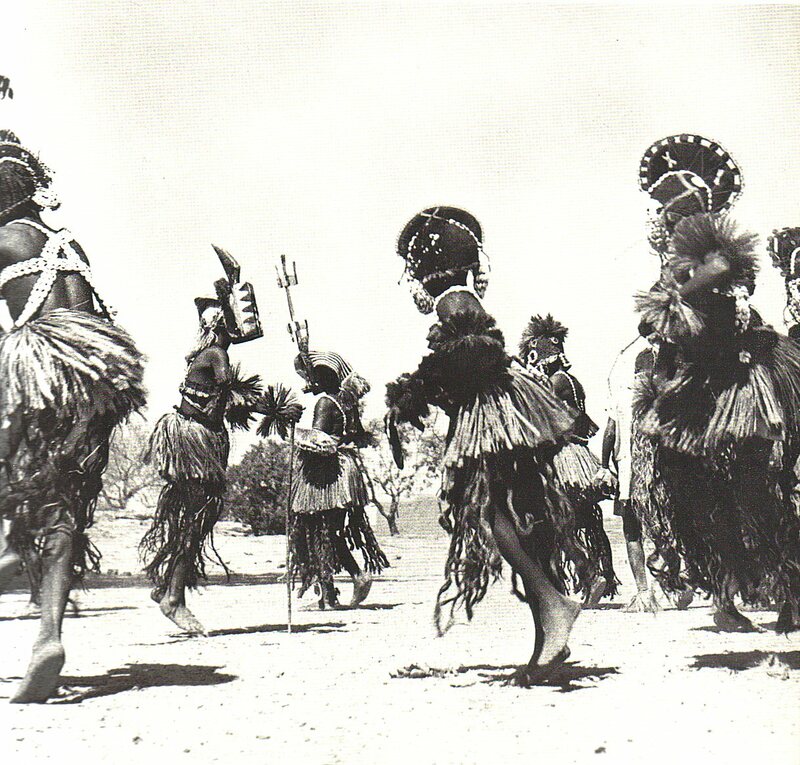 Griaule's visit in the 1930s, more than a hundred masks still participated in a great dama. and begin to understand both the elements which define the type and the differences in aesthetic quality. 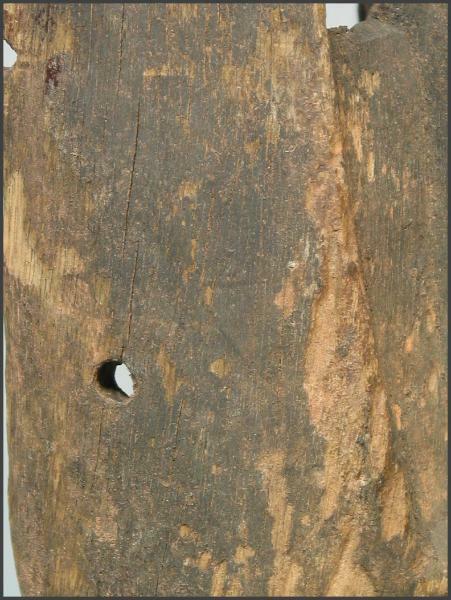 the holes and hollows are almost more important than the solid forms. SALE N07845 AUCTION DATE 15 Nov 02 10:15 AM. Cf. Vogel and N'Daiye (1985: 26 and 123, figure 16) for a closely related example of a `black monkey' mask in the collection of the Musée de l'Homme. I could not find an example of a "Red monkey mask", but I am looking. 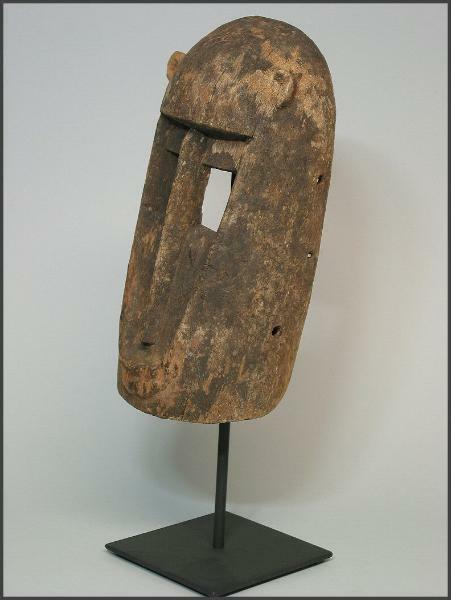 Below are examples of other types of Dogon animal masks for reference purposes. have to look into it. sauvages" presumably using animal masks. 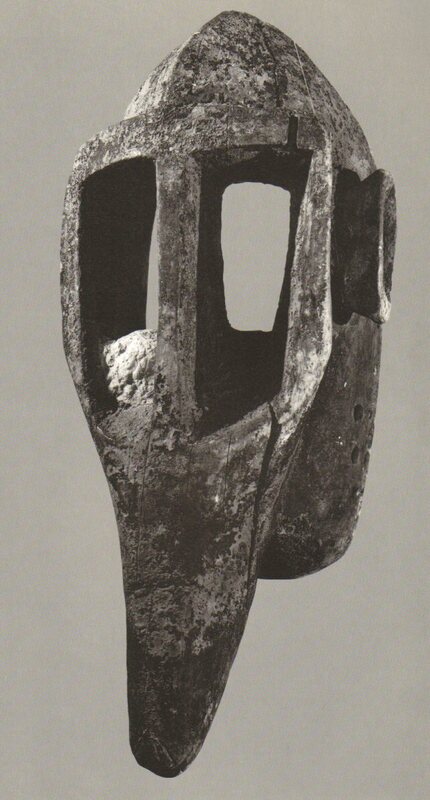 After the soiree the masks that had been used were acquired by the museum—this rabbit mask among them. plane, and creating a unified, vibrating surface. 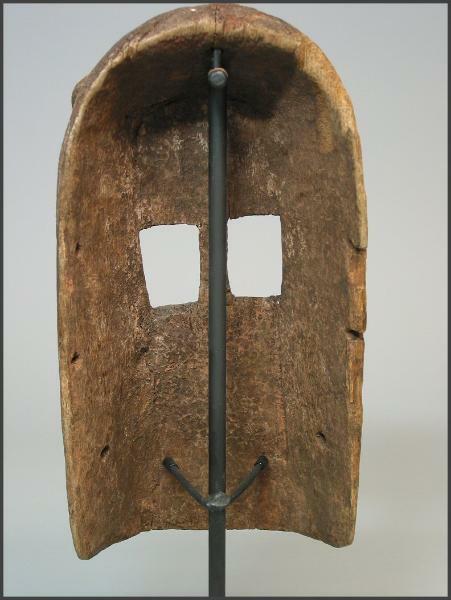 of all masks: to provide material sup¬port for the soul of any living being that dies, to protect it from injury. name it and integrate it into the myth. F.N. SALE N07996 AUCTION DATE 14 May 04 10:15 AM. the domed crown with demilune ears bisected by a medial ridge; varied and encrusted medium to greyish brown patina. Cf. 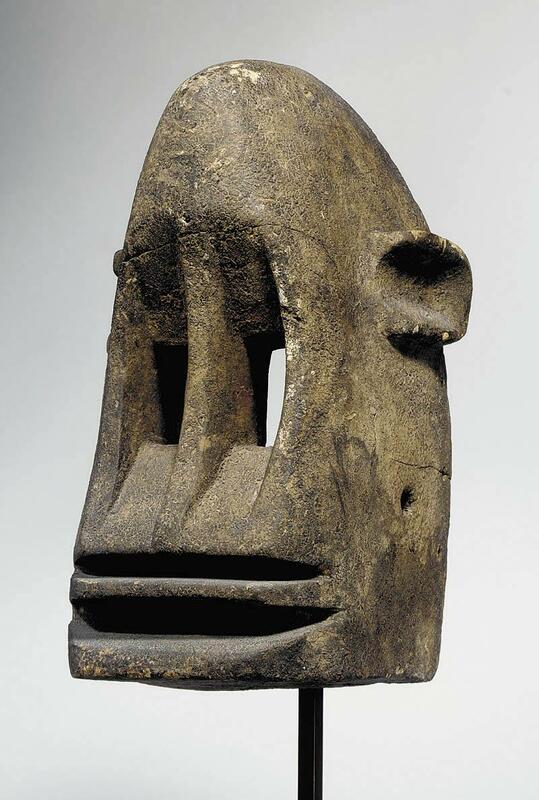 Leloup (1994: 563) for a related mask and Bastin (1984: 64, figure 9) for a sketch by Griaule in Masques Dogon (1938) of another related mask. SALE N08132 AUCTION DATE 11 Nov 05 10:15 AM. incised horns; weathered golden brown surface with areas of black pigment. SALE PF3015 AUCTION DATE 05 Dec 03 2:30 PM. champlevé est à motifs de triangles inversés. Traces de pigments noirs et de kaolin dans les creux du visage. decoration is with reasons for reversed triangles. 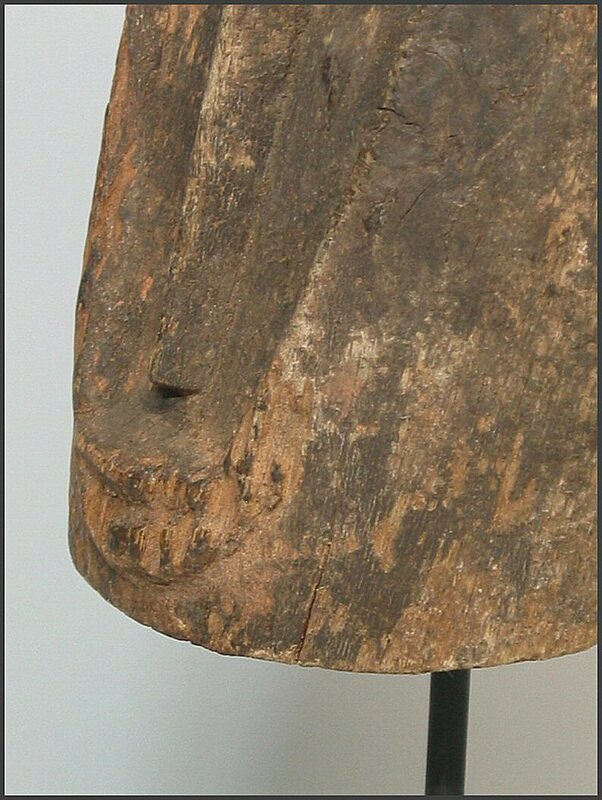 Traces of black pigments and kaolin in the hollows of the face. 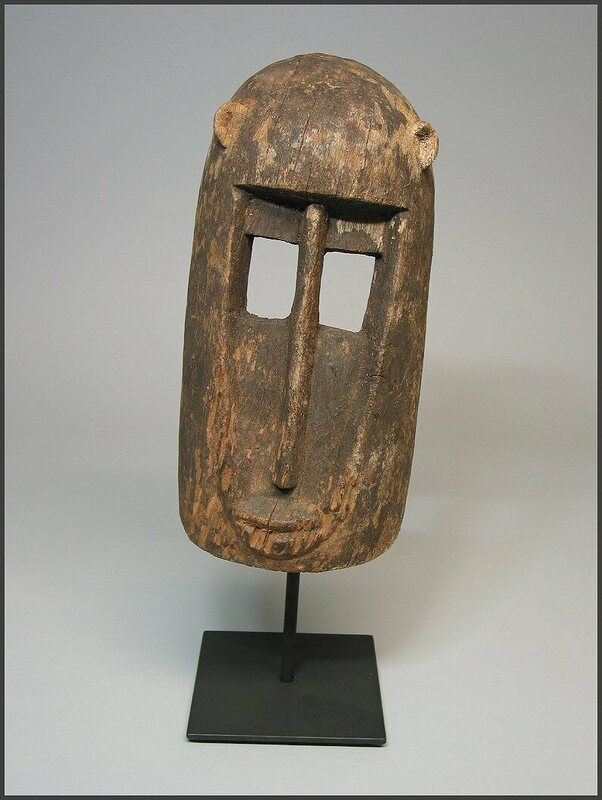 This mask is accompanied by a certificate from Galerie Ratton-Hourdé, Paris. fecund the women and the cattle. abundant consumption of food and millet beer. Sometimes the dama may last as long as six days. end of a rope by one of the initiates. 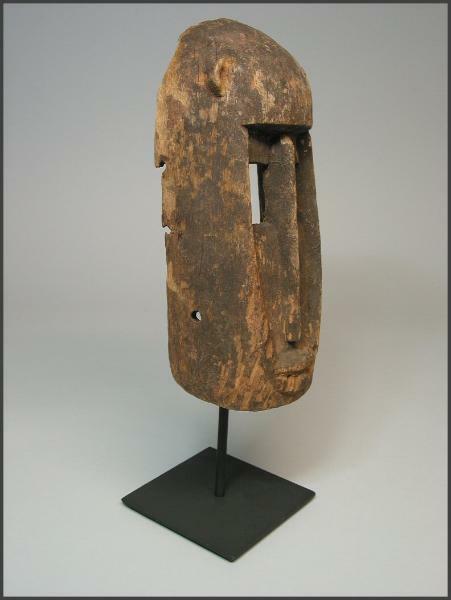 The humming sound of this instrument is regarded as the voice of the very first ancestor. audience, enthusiastic but solemn, watches with great attention the development of the different stages in the ritual. At the dama of a spiritual chief or a village notable, the place where the sacred dances are held is invaded by an impressive number of different masks. 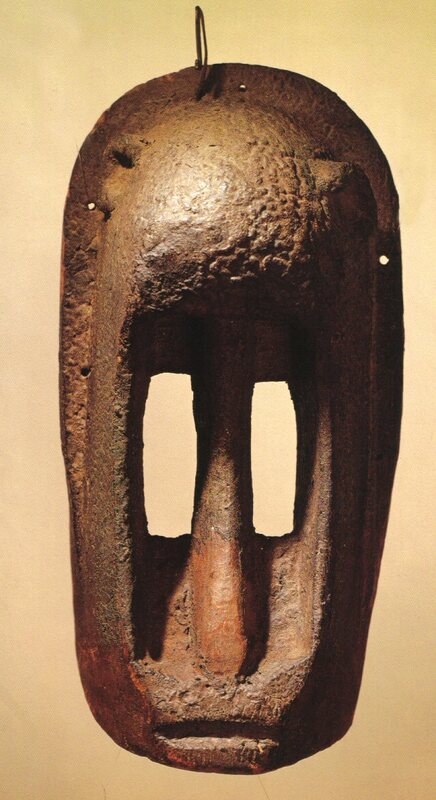 Of these the most numerous and the most symbolic are the kanaga and the sirige masks. the upper blade, downwards for the lower blade. 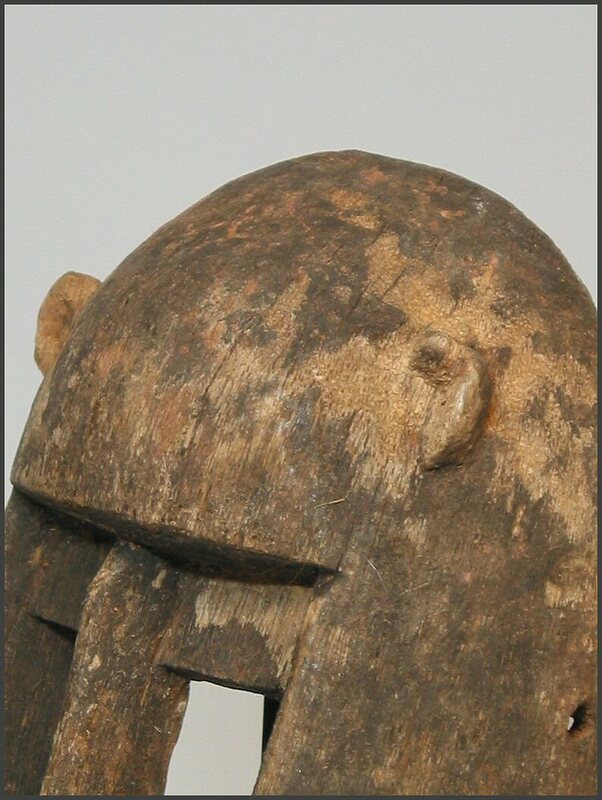 The face of the mask is partly encircled by a crest of very stiff fibers, dyed either red or yellow. of the first trouble-maker, Ogo, the pale fox. close to the ground, thus evoking the internal vibration that animates the matter created for Amma. universe being created by the rotation of the divine axis. Kanaga and sirige are followed by masks that are more familiar to the uninitiated, since they are made in accordance with a less abstract concept. 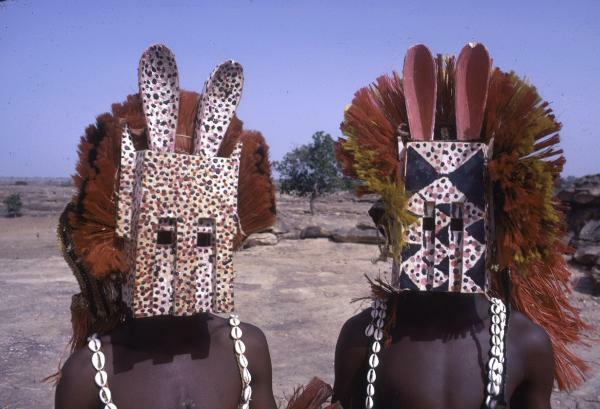 of Dogon people, masquerades and the area where the Dogon people live.